Dunlop: [running] Whoa! Aaah! Get... Get away! Get them away! Brant is a no nonsense copper. Frequently in trouble for violent conduct, he drinks hard, smokes where he likes and can't operate a computer and sees typing to be like cooking – women's work. He is pretty much on his last chance whenever someone start killing police officers. The killers calls himself Blitz and informs a journalist that he intends to kill 8 more officers; meanwhile Brant joins his boss Nash to try and catch the killer before he strikes again. Bit of an odd film this; it sort of does enough to be entertaining but at the same time it seems to want to pull in a direction that doesn't really fit the material, while also rather fudging the darker drama that it also could have been. The end result is a bit of a muddle but it is solid enough to get by. The film starts with Brant taking on some yobs and then is followed by a scene of him being tough in the face of the department doctor – so far, so much to be expected. Unfortunately for the film, the rest of the plot doesn't really lend itself to this sort of cop – he feels like he would be more at home in more of an action movie. So when Brant is around the film is a little bit cheeky and a little bit tough, but otherwise it keeps taking odd paths. So for example the entire thread with Falls seems wasted – her drug use, her relationship, none of it seems to fit into the rest of the film. This rather muddled feel also leads to the film not quite delivering in any specific way. It feels like it should be a tough-talking action movie, but yet it never becomes one. It feels like there are character-driven aspects to be had, but yet you never get to the heart of anything. It sort of does a bit of all of this well enough to get by – but this is what it is doing, getting by. The actors help it greatly, even if their presence may also have guiding the film down certain roads. I think this specifically about Statham who is a strength to the film while also being a possible factor for the confused approach. He does "Stratham" and does it well and kudos for a guy getting Hollywood money to be coming back to the UK to make movies. He is a real presence in the film but too much of it seems geared towards his performance when it should have gone other ways – he is still good, but he should have gone with the film, not the other way around. Considine must have signed on to a different script, because he literally does nothing here – such a great actor and he has a role that has so little to it that anyone could have done it. Gillen also seems to have a lack of material – he is OK but the film never lets him be more than who he is the first time we see him. Ashton is good as her struggling addict, but the film does nothing with her so her hard work is wasted. Morrissey has little to do – again I presume the script that he signed to was more intelligent that it turned out to be in the final version? 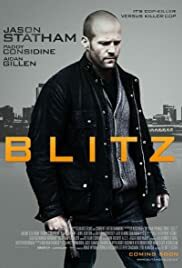 Blitz is an OK film because the main plot is solid enough and Statham is grizzly enough to keep things going. However there is a lot of wasted potential here in the actors and in the various plot threads – it feels like they had more than just a basic police thriller in their script, made a better but more complex film but then ended up cutting it back to be a film that would appeal more to those coming to see a "Jason Statham film", even though bits of the previous film were still included whether they worked or not. Solid enough to fill the time, but somewhere in that editing room there is a much better film than this one.